The soaring journey we've been on with Hiccup and his dragon pal Toothless is coming to an end, but it's not to be met with sadness. 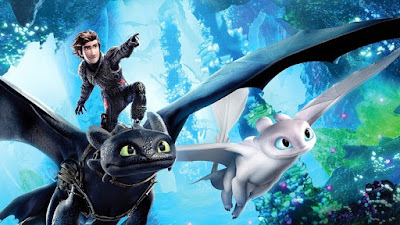 How to Train Your Dragon: The Hidden World is more than just a satisfying end to the high-flying franchise that has been around since 2010, it features action and emotional notes that rank among the series' best. You won't want to say goodbye to these characters we've loved for so long, but you'll be happy with where they are headed. This story finds Hiccup (Jay Baruchel) now fully-cemented as leader of Berk, the Viking clan that once had a fear of dragons but now live among them in harmony. As their home has become a dragon sanctuary, so too has the chance for danger been increased as trappers and hunters are everywhere. From the beginning Hiccup's arc has been of trying to learn to believe in himself, to find his place in the world. He was the only one of his people to befriend a dragon, his beloved Night Fury named Toothless, and now he's changed the hearts and minds of everyone he holds dear. But Hiccup's issues with self-confidence remain, as the possibility of marriage to Astrid (America Ferrera) looms, and the arrival of a new foe, Grimmel (F. Murray Abraham), who stands opposed to everything he believes. The Hidden World is more of a love story than previous chapters, as the introduction of a female Night Fury, which they begin calling a Light Fury, has Toothless sprung like a virgin on spring break. At the same time, Hiccup must learn to cope with the idea of a life without his dragon buddy, and whether he can still be an effective leader. Franchise writer/director Dean DeBlois wrote multiple drafts to come up with just the right story, one that hits on all of the primary themes while advancing his two main characters forward. He also introduces the villain in Grimmel, whose glee for hunting down dragons, in particular Night Furies, strikes at the core of what these movies have always been about. Despite Abraham's enjoyably theatrical performance, Grimmel isn't as physically threatening as he should be. As a foil Grimmel's greatest impression is as Hiccup's ideological opposite. While How to Train Your Dragon has achieved more than its share of accolades, I've always felt it never got the due it rightfully deserved. Part of that may be its mature tone, as these movies have never been what you would call cute or cuddly. DeBlois lightens things up a little bit, with Toothless' ridiculously awkward attempts to woo the Light Fury, and Hiccup not exactly the best teacher. The supporting cast also provide a great deal of humor, with Kristen Wiig's annoyingly-vain Ruffnut and Jonah Hill's Snotlout getting increased attention. Unfortunately some of the other female characters important to Hiccup get moved into the background. Astrid has a couple of nice moments lifting Hiccup's spirits, but they could've done a lot more with Cate Blanchett as his warrior mother Valka, who was so prominent before. The connection between Hiccup and Toothless is as natural as ever, though. They've gone through some ups and downs, literally, but this movie really gets to the heart of their bond and how it's been strengthened by their many ordeals. When faced with the very real possibility of leaving one another for good, it's heartbreaking not only for them but a real gut punch for us, as well, and I expect there won't be a dry eye in the place during the final bittersweet moments. Just how "final" they are remains to be seen, and the door is left open just enough that we may get to glide through the air on the back of a Night Fury again someday.